In this work, temperature measurements at the focus of spherically converging shock waves (CSWs) in argon are revisited. 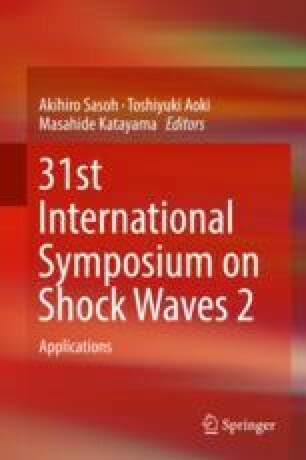 Spherical shock waves are produced inside a conventional circular shock tube, where initially plane shocks are transformed into spherically shaped shocks inside an axisymmetric smoothly converging section. As the CSW reflects from the window, the conditions become extreme so that the gas intensively glows. The light flash collected through the window by optical fibers is separately transferred into a diagnostic setup including a spectrometer. The gas temperature at the cone tip is then deduced from Planck’s fit to the registered radiation spectrum. Maximum temperatures of order of 30,000 K are thus measured. In this study 1D axisymmetric numerical simulation accounting for nonideal gas effects (excitation, Coulomb interaction, ionization, and radiation) assuming equilibrium is employed to study the details of the shock implosion. The prominent advantage of the numerical approach over approximate method used in (Liverts M, Apazidis N, Phys Rev Lett 116: 014501, 2016) is that the calculation can be extended to trace the behavior of the gas behind the reflected (diverging) shock that inevitably dictates the temperature dynamics at the implosion focus. As a result, a comparison between calculations and experimental data demonstrates an improved agreement.